Somewhere there may reside a person who has never fallen into a loop of negative thinking about something they said or did. But if there is, I haven’t met them yet. Sometimes it starts with an attack from outside. You receive a negative job review or a good friend strongly criticizes you. Perhaps it was a parent, or a teacher, or a coach who gave you a dressing down. Children are especially vulnerable to such attacks. Sometimes it starts in your own mind. You had a meeting or a conversation and go home thinking "I should have said…" or "Oh why did I say…?" Then you spend the next several hours replaying the whole scene over in your mind until you're ready to scream. Sound familiar? 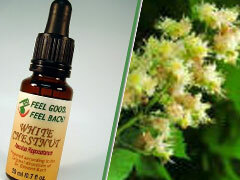 That's a negative White Chestnut state – and everyone is susceptible to them. You can’t let it go, and it even interferes with sleep. Untreated, it can lead to chronic frontal headaches. Children are always in danger of falling into the negative White Chestnut state, because they are often not allowed to speak up in their own defense. They’d love to say “You were wrong,” to a parent or authority figure, but they fear the consequences. Treatment with the Dr. Bach's Flower Essence White Chestnut allows you to settle down and release the impulse to replay negative conversations. It lets the mind discriminate between thoughts that are helpful and those that are not. In essence, it allows you to once again connect with and accept guidance from your Higher Self. To see an overview of all of Dr. Bach's Flower Essences and their benefits, visit FeelBach!